Posted on Fri, Nov 18, 2011 : 6:47 p.m.
Mridula Shanker, 7, holds a Guinness World Record for number of hula hoop rotations while standing on one leg. 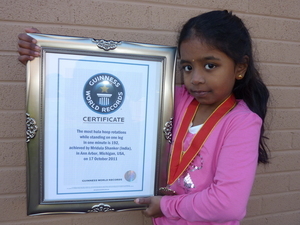 At 7 years old, breaking world records already is coming naturally to Mridula Shanker. After teaching herself to hula hoop by watching videos on YouTube about a year ago, Mridula already has one Guinness World Record under her belt. And she’s got her sights set on a few more. The second-grader at Northside Elementary School in Ann Arbor marked 192 hula hoop rotations around her waist within one minute while standing on one leg. How’s that for multitasking? "I like breaking records," she says. Mridula holds up her award from Guinness. To get her record, Mridula submitted a video of her Oct. 17 feat to Guinness World Records Challengers. She had to follow a number of challenge rules, specifying the type of hoop used in the challenge, where the rotations must occur and that the leg may not be changed during the attempt. Her father, Shanker Kalyana-Sundaram, said Mridula discovered the videos while browsing the Internet. She bookmarked her favorites, headed to her room and started practicing, often around two hours a day, in time to perform in her school’s talent show, Northside’s Got Talent. The video of her performance, below, is posted on YouTube. In it you can see “Hooping Star” Mridula continuously twisting and turning the hoop around her hands, waist, neck, legs and body — all while dancing and moving about the stage. "Instead of watching cartoons, she's hula hooping," Kalyana-Sundaram said. "It's good for her. It makes her busy." After Mridula started practicing more and more, Kalyana-Sundaram said they started filming her tricks. Then came the records. 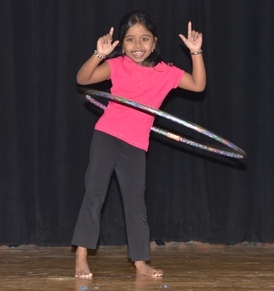 Mridula started hula hooping around age 6. "I love doing it," Mridula said, although she's not quite sure why she likes it so much. She said she mostly hula hoops by herself, although she's showed off some of her skills to her friends, too. And of course she's already planning for this year's talent show. Rick Dekeon, physical education teacher at Northside, said he's amazed to see what Mridula has accomplished. Although they sometimes use hoops during warm-ups in gym class, it's nothing like Mridula's record-breaking tricks. "Some of the stuff she does is amazing," he said. "There's nothing like that. She explores new ways to do it — like around her neck. It's amazing to see." Dekeon said Mridula brought her Guinness award in to class with her this week to show it off since she was so excited about it. He's proud of his student for trying new things, he says, adding that in his 24 years with the school, he's never had a student break a national record like that. "I'm happy for her," Dekeon said. "She's not afraid to try new stuff." Kalyana-Sundaram says he'll keep encouraging his daughter as long as she's interested in hula hooping. "She's also into gymnastics, so they go very well together," he says. Although Mirdula doesn't have any specific goals right now, he said he's glad she's taking the opportunity to explore. "If she does everything with passion and love, she can do anything," he said. Mridula just may have a few new tricks up her sleeve, too, combining her gymnastics (see videos of her record number of flips and headstands here) and her hula hooping. "It's kind of hard," she said. "It's going to take a lot of practice." Thu, Nov 24, 2011 : 4:50 p.m.
Sun, Nov 20, 2011 : 10:02 p.m. Excellent work, she rocks ! Sun, Nov 20, 2011 : 4:34 p.m.
Wow great! Congratulations Mridula!! also watched her other videos, amazing stamina and natural talent. Keep it up. Sun, Nov 20, 2011 : 12:47 a.m. If those aren't the Traver Knoll Apartments behind her, I'd guess they're next to Island Park, off Maiden Lane. But a tremendous change has taken place in Northside's talent shows since I went there; they were held in the gymnasium, and all the spectators were students and teachers. Of course, there were no curtains. A class might do a charade, or a medley of songs. A single student might play a song on a musical instrument, portable or not. One group of boys did tumbling poses that the rest of us wouldn't be doing until ninth grade. I guess the _____________'s Got Talent! idea has spread farther and deeper than I ever suspected before. Sat, Nov 19, 2011 : 10:27 p.m. Sat, Nov 19, 2011 : 8:57 p.m.
forget the wolverines today... Mridula is the real star today. Sat, Nov 19, 2011 : 6:51 p.m. Sat, Nov 19, 2011 : 2:04 p.m. Sat, Nov 19, 2011 : 1:45 p.m. Sat, Nov 19, 2011 : 1:03 p.m. Saw this when I woke up Saturday. What a joy to wake up to! Congratulations, Mridula!So cool! Sat, Nov 19, 2011 : 1:01 p.m. It's hard to believe you started just a year ago. You're a great performer! Congratulations, Mridula! Sat, Nov 19, 2011 : 12:09 p.m.
Yeah, she's pretty amazing. We saw her at the Northside talent show last March. Hopefully she'll be on stage again this year. Sat, Nov 19, 2011 : 3:40 a.m. Fantastic! As one who tried for years to hoola hoop and could never get the hang of it, I'm highly impressed. Sun, Nov 20, 2011 : 4:44 a.m. Ya, you aren't alone there. Sat, Nov 19, 2011 : 2:34 a.m. Sat, Nov 19, 2011 : 1:18 a.m.
That is just great. We have a superstar right here in Ann Arbor! WAY TO GO MRIDULA!!!! Sat, Nov 19, 2011 : 12:26 a.m.